Google — Motorola was a win, we could’ve won with Groupon, we’d never do what Amazon is doing. Welcome back to the seminar room. This is the second and final session of our Google Master Class, where former CEO Eric Schmidt and former senior VP Jonathan Rosenberg (who currently are still affiliated with the company as, respectively, Executive Chair and advisor to the CEO) are discussing the inner workings of one of the world’s most important companies with a fellow author of a book on the firm, i.e., me. (For those who overslept, here’s the first session.) Schmidt and Rosenberg’s How Google Works is once again the starting point for our instruction. And then it gets interesting…. [Steven Levy] In your book you say Google runs on the power of people you call “smart creatives.” Can you define that term more sharply? Must they be technical? [Eric Schmidt] Smart creatives are technical in some interesting way. They have some kind of business acumen, and they’re curious. And I think the Associate Product Manager program is the best example of that criteria. That’s the program designed to create Google’s future leaders, recruiting young people who don’t want to be pure coders, but have computer science degrees. In your book you tell how you refused to let Kevin Systrom in the program because he didn’t have that credential. [Systrom quit Google and co-founded Instagram.] What percentage of Googlers are technical people, and how many are “athletes,” the Google term for non-technical people with big brains? [Schmidt] The company’s goal was to be 50% technical, 50% non-technical. That’s alarming because that the vast majority of companies are 20% technical. But we want to be a software developer heaven. And being blunt, it’s somewhat easier to hire the non-technical people—they’re more likely to show up. The compensation reflects that. We’ve largely stayed on that path even as the company has grown. [Rosenberg] We always found a role for great athletes who weren’t technical. 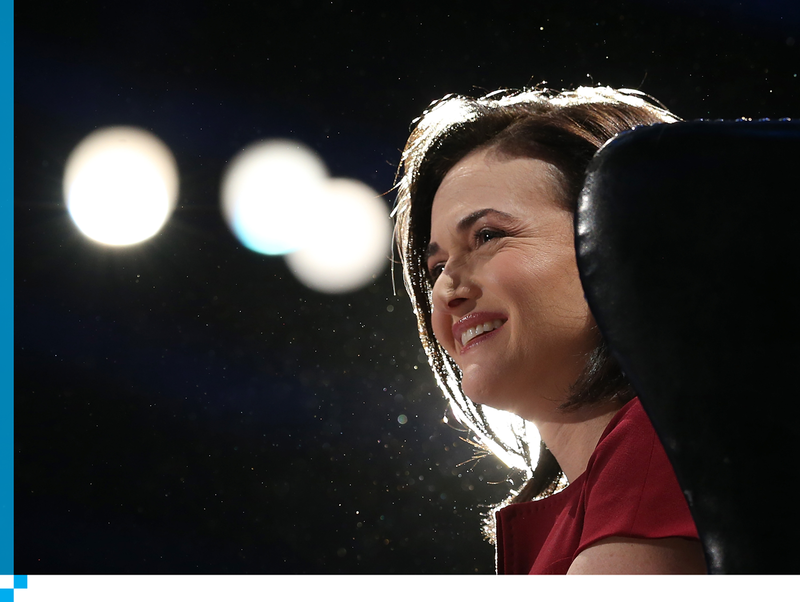 [Schmidt] The best example is Sheryl [Sandberg]. We hired Sheryl because I thought she was incredibly smart and she’d be useful. She didn’t have an initial job. When the online business came, which was a year after she was hired, she embraced that and built a $20 billion business. If you’re not a “smart creative” and you’re a young person in today’s economy, are you toast? [Schmidt] You’re not going get the kind of economic and personal returns that the smart creatives are going to have in these new companies. If your model of work is that you graduated from college and you’re going do the same thing over and over again, you’re missing the narrative. You talk a lot about recruitment and hiring. It used to be that one’s SATs and GPAs were crucial, even for people in mid-career. And there was a huge premium in graduating from an elite school. Eventually data emerged that Google’s practices were too extreme — your hiring czar Laszlo Bock made news by revealing this. But has hiring really changed at Google? Are you looking beyond the elite schools? [Rosenberg] I don’t think that it was ever a dynamic where you had to have gone to one of a number of schools. In that crazy maelstrom of hiring in those first years, just for convenience, it was possible to go to only a few places. It was just that the majority of the recruiting was at those schools. In the early years we had huge fights when employees told us to hire a friend who’s done all these great things but was not from a top school or didn’t have top GPAs, and we would not hire them. We had an independent recruiting process, a model based on universities. We have a hiring committee independent of the hiring manager. And all the offers were viewed by the senior executives, including Larry, and we would look at people who were buddies of so-and-so who were undistinguished and send it back for more review. I kept hearing that Larry would often question a candidate because he or she came from a non-elite school. [Schmidt] No, no, no. I was part of this process — we would look at the package and we would look at the totality of the person. My favorite example is a fellow who was at Berkeley and didn’t like sophomore year. He was very strange. He was clearly not a person who was going get through college because it was too boring for him. We hired him and he’s the guy who invented the spelling corrector. So the system would adapt for such people but it would discriminate, if you will, against hiring people who looked generic. 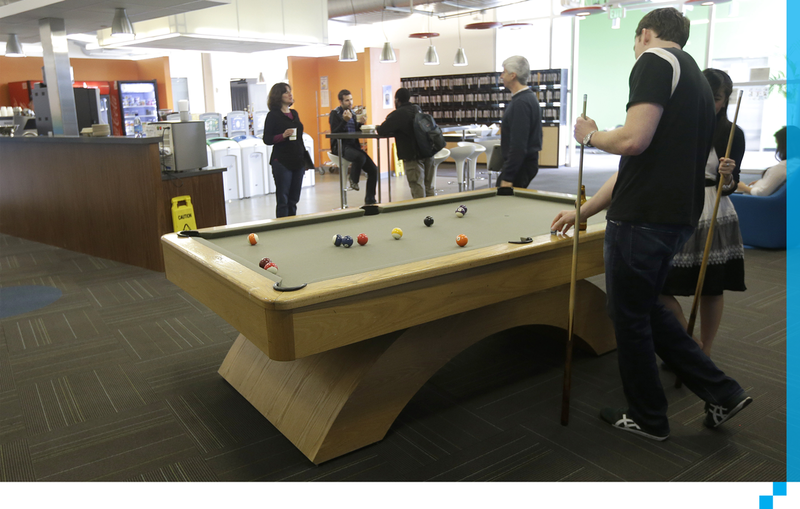 Google employees shoot pool at in a break room at the Google campus in Mountain View, Calif., 2013. Craig Silverstein, Google’s first employee, told me that the company originally had a strict “no-assholes” rule. But he said when Google got bigger, it could afford to hire the occasional super-talented jerk because the organization could absorb that person. [Schmidt] There is no action that I took or saw which is consistent with that. I feel very strongly that the people we were hiring were going have to collaborate with others. I’m not going to argue Craig’s words, but the principle was that you had to be able to work with others and we always enforced that. Now that doesn’t mean that you’re a nice person or that you bathe properly, or whatever. We’re just saying the test is, “Can you work with other people to effect change?” We would reject somebody who made people feel bad during the interview. The typical way they did that is not by being quiet but by being arrogant. I, me, I, me, this is what I did . . . rather than understanding that they were going to join a corporation. In my first year, I would get phone calls from people that I knew, and they’d say “’I’m the VP at company X and in my career path I need to be a chief operating officer. . . .’ That was always a signal that I should hang up. And by the way, because of the packages we were giving out then, before we went public, those people who did that cost themselves a half a billion dollars in personal wealth. So you want to put a price on arrogance? Okay! Let’s talk about how Google competes. Larry has said that instead of trying to make a better version of what someone else is doing, companies should do something new that’s ten times better. [Schmidt] You shouldn’t do something which is a copy of somebody else. There are two reasons for that. One is, it’s sort of rude. But the other is that if you’re a challenger against a large scalable incumbent, you have to do something orthogonal. In a network effect business, you have to do something different and it has to be sustainably different. Google has had success doing just that, but some people — including a few I’ve spoken to at Google — say that the company hasn’t stuck to that principle in its social products. [Schmidt] I’ve seen that criticism. The simple answer is that if you define Google Plus as the same thing as Facebook, you don’t understand what Google Plus is. Google Plus gives us a name relationship framework that we can use for all of the Google services — it helps You Tube get smarter, it helps the search stuff get smarter. There are many, many good reasons why that platform helps us. 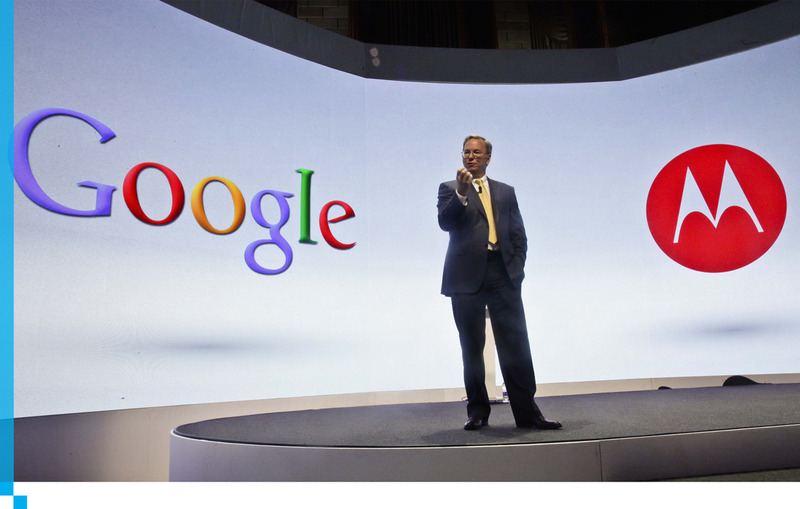 Eric Schmidt, Google’s chairman, speaks during a press conference in 2012 in New York, the first after it became a a part of Google. Let’s talk about acquisitions. You had some amazingly successful ones, as well as some flops. I don’t know where you’d put Motorola on that spectrum, since you sold it to Lenovo for much less than you paid for it. [Schmidt] We don’t expect all the acquisitions to be successful. We do expect the acquisitions to give us options and some of those options really paid off very, very well, like Double Click and YouTube. If the consequence of the Motorola buy-sell is that Lenovo ends up being a global Android platform and brings prices down, you could argue that on a strategic basis it was a very smart move. I believe financially it was a good move independent of any other fact, right? [Rosenberg] Depending how you value the patents, the math adds up correctly. What I think the legacy of the Motorola dynamic has been is that the price of smart phones worldwide has come down significantly. [Schmidt] When we took the sale to the board we went through all those numbers and it was fine. It wasn’t a huge success and it wasn’t a huge loss. There’s one acquisition I bet you’re happy you didn’t make— I understand you came very, very close to buying Groupon. [Schmidt] Yeah, we talked to them. So the fair question for a company like Groupon is, were you to acquire them, which we obviously did not, and you put your principles in it, what would you have had? If it were part of Google, it might have been a different outcome. Google would not have done many of the things that Groupon did, just as a matter of business policy. It’s just not how we operate. One final question. Your publisher is Hachette, which is famously feuding with Amazon. On the day before your book was published, Amazon wasn’t taking preorders, and didn’t even acknowledge a hardback book existed. [Schmidt] We know this well. Would Google ever do that something like that? [Schmidt] Well, let’s ask the question: Has Google ever done that? Has Google ever done that—in a market, exclude one competitor from an end user service? I think the answer is no. [Schmidt] Somebody would say why are we penalizing that group over this business issue? That would be how the debate would occur. The way I would nail this is to say, Google believes we’re organized around our end users. You asked all these other questions, and I think my general statement is that we’ve got lots of problems and regulations and rules and politics and issues and shareholders. But as long as you’re on the side of the user, you’ve got a pretty good answer. That’s always been true and it’s allowed Google to get through a lot of stuff. We’re not actually focused on the advertiser or the other competitors or so forth. We’re focused on the user. Judge us based on that.